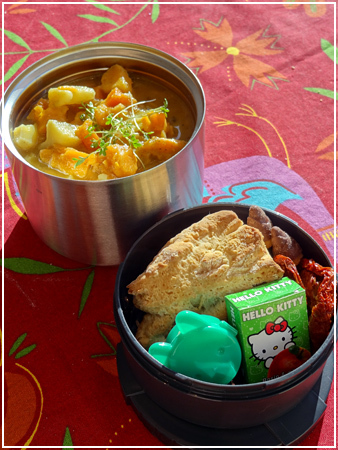 Sweet potato, potato and carrot curry “soup” with cress on top, homemade scone, sundried tomatoes, raisins, chocolate, and butter in a kitty container. 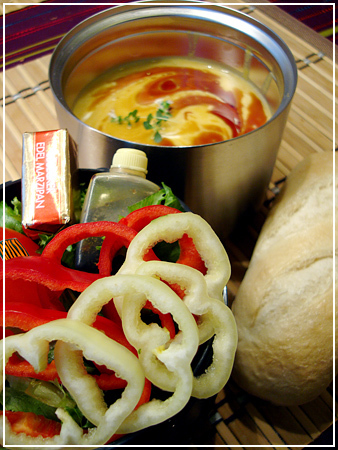 A lovely and spring-y tomato soup, full of flavour and goodness. 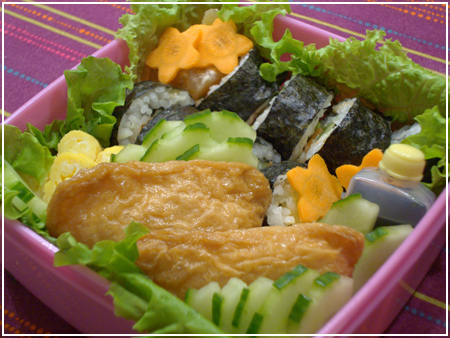 Makes 2 portions as a light summery main dish. Warm the olive oil in a wide skillet. Add garlic and chili flakes and fry for a minute, without burning the garlic. Add tomato concentrate and the bouillon cube and fry as well. Add the pureed tomato in installments, allowing the sauce to boil down and thicken between additions. Finally, add spices and water to desired soup consistency (or keep thick if you want a sauce), boil up and stir down half the mozzarella. 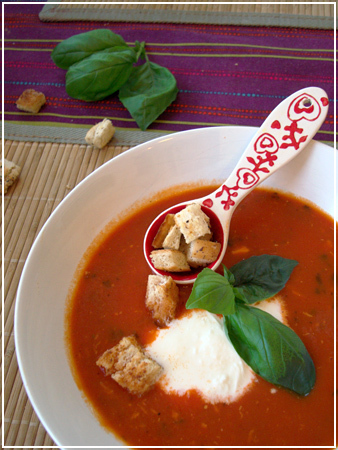 When the mozzarella has melted, dish out into soup bowls and decorate with some slices of mozzarella and basil leaves. Halloumi, lettuce, rucola, tomatoes and mini-pitas I baked myself (in a break from studying) on Sunday in the big box. 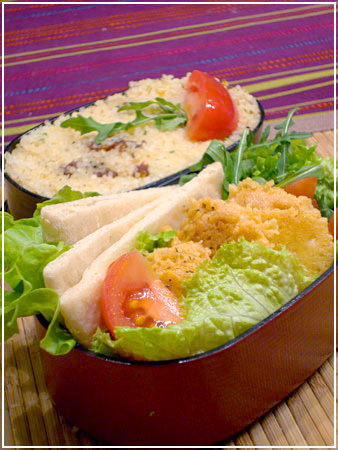 Bulgur with sundried tomatoes in the small compartment. I might bring another pita on the side… not decided yet. This one I made earlier this week but didn’t even have a chance of posting until now, I’ve been so busy. 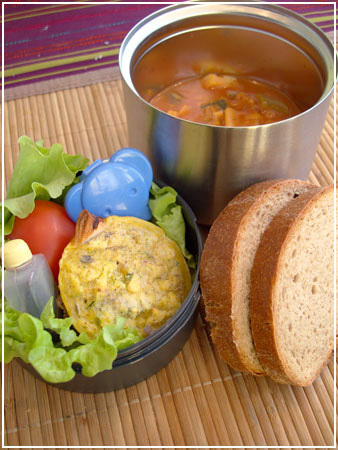 It’s minestrone in the thermos can, a mini-quiche and a whole tomato in the other container and a blue elephant containing butter for the dark bread that I took on the side. It all fit nice and snug in the bag that comes with this set, which is another reason I like this set so much! Finally #250! 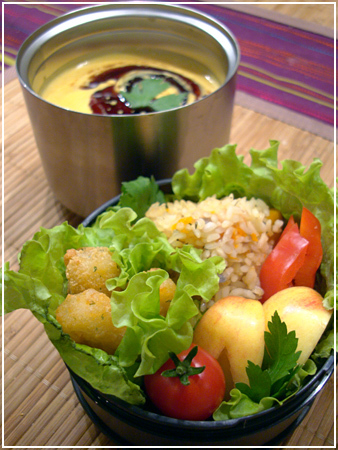 Not much in the way of charaben, but the celebratory autumn theme definitely is in the food! Pumpkin soup is just a part of autumn to me. 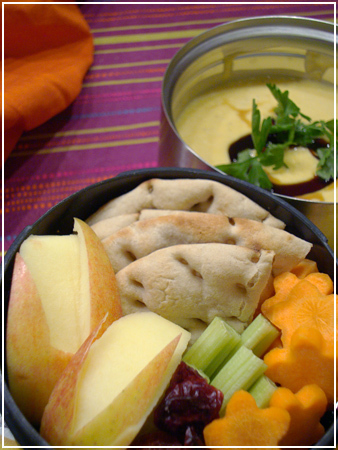 Then there’s a piece of stuffed butternut squash in the extra box, together with apple bunnies (apples are also very autumny to me), mozarella cheese sticks, bell pepper and a cherry tomato. 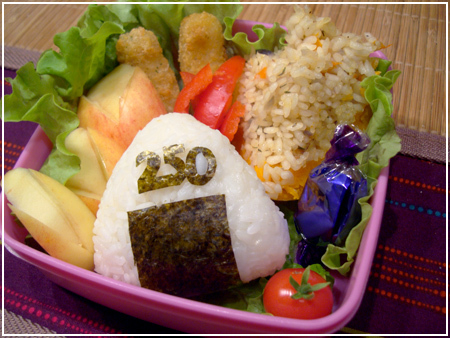 BF can warm the soup if he likes, if he doesn’t there’s the same food plus an additional riceball saying “250”. 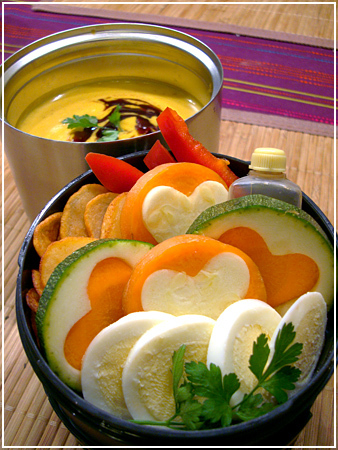 Fried sliced potatoes, red bell pepper, zucchini and carrot heart cutouts, half a sliced egg and a bottle of pumpkinseed oil for dressing in the box. This is all going to be tossed and make a side salad. The thermos flask holds cream of pumpkin soup with some pumpkinseed oil and parsley on top.